I love the new Close To My Heart Easter Time Stamp of the Month Stamp Set - I was making "a" card for a challenge and then got carried away. I was on a roll - just thought I'd share. These were all basically pretty easy to make. 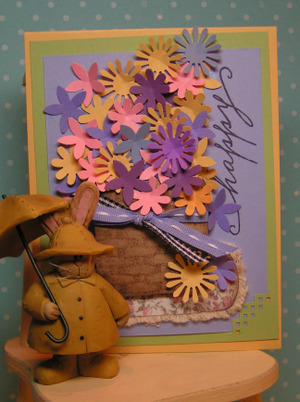 The one with all the flowers is a Stampin' Up! Punch that punches three flowers at one time so it looks like more work than it really is. 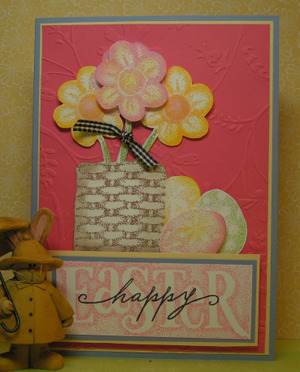 The flowers in the basket are just stamped, cut out and popped up - pretty easy. 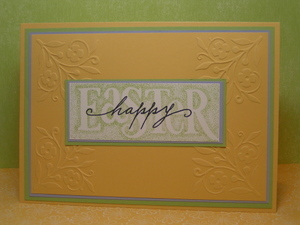 I really like how the word "happy" looks over the word Easter. This set is available through the end of January. 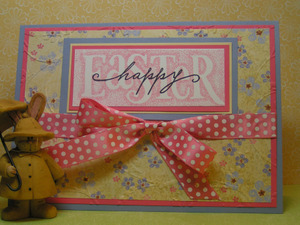 Hope you feel inspired to make some cards. The Sunday Card Sketch Challenge goes through Friday - give it a try. What beautiful cards. I love the one with the flowers. I can't want for spring! Love the cards!! It's funny how you see a set in the catty and not 'feel' it, but then you see it used and you've gotta have it. These are beautiful cards! All of those are just wonderful!! Love your cards! You always do such beautiful work?